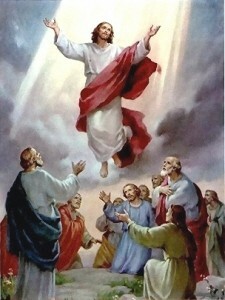 Ascension is the day that Jesus rose body and soul into Heaven to sit at the right hand of His Father. Forty days after His Resurrection (on the third day after His death, Jesus rose from the dead, body and soul. His empty tomb was found Mary Magdalen, Mary the mother of James and Salome, and other holy women are the first to find the tomb empty. Thinking Jesus’ body was stolen, they ran to tell the apostles and St. John and St. Peter confirm the empty tomb and believe), Jesus ascended into Heaven and promised to send a Counselor to help guide the new Christians and us. Jesus also promised to return to earth in the same way that He left. He was taken up into the clouds, which is how He will return some day. We are to look to the promise that we too will join Him in Heaven, body and soul. We are to celebrate the gift that He sent us in the Holy Spirit on Pentecost in 10 days. The Ascension is the promise of Jesus that we too will be raised with Him into Heaven someday. Pray that you will join Him in our new and perfect heavenly bodies.